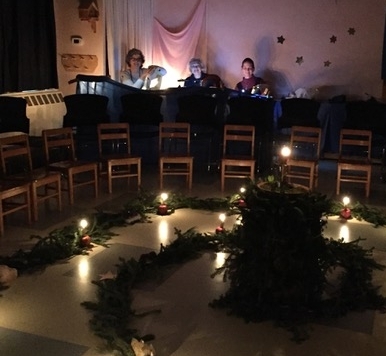 In 2017, Colleen Shetland and I played for the Washington Waldorf School for the opening day assembly welcoming first graders, and the Rose Ceremony at the end of the school year. In December we played for their Advent Gardens (now called Evergreen Gardens), along with Anne Frances Martin. There were classes pre-K through twelfth grade, a total of 16 gardens covering three days. Anne Frances, Colleen, and I also played for a homeschoolers’ garden and for the Acorn Hill Waldorf Nursery and Kindergarten’s Midwinter Gardens, for seven different classes. We met with Pat O’Connor as a foursome and had some seasonal practice sessions in a classroom at the Riderwood retirement community. In March, Pat and I played lyres and sang a spring seasonal selection for our church group’s monthly dinner meeting at Riderwood. About 19 people came, and at the end of the dinner they were given the opportunity to hold the lyres and make tones. People expressed how much they enjoyed the evening and experiencing the lyre—many for the first time. Mostly recently, Pat, Colleen, and I played a prelude together at a memorial service for Portia Imle at Riderwood Chapel on February 9, 2018.